Storyboard Pro allows you to sketch your drawings, forcing disconnected lines to come together automatically, forming a single line from multiple strokes! Once you draw your lines, you can even change sections of them by increasing their thickness or adding joints. A variety of pencil styles are provided allowing you to create and save your own.This way you can create pencils with precise sizes and parameters and save them. 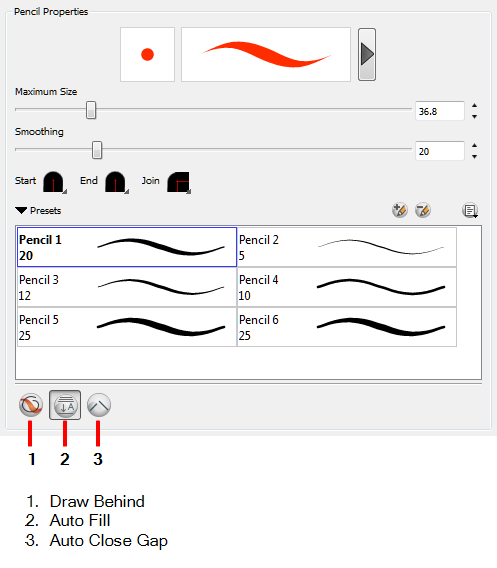 • In the Tool Properties, select a pencil style from the Presets section. 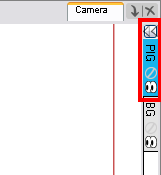 In the Thumbnails or the Stage View, select a vector layer to draw on. 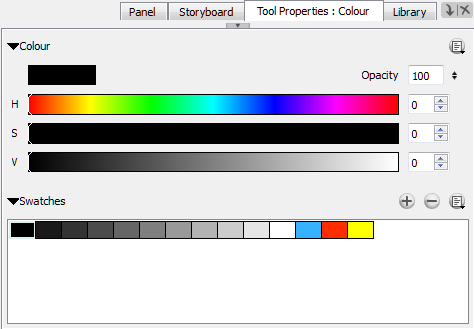 In the Tools toolbar, select the Pencil tool or press [Alt]+. ‣ Hold [Alt] to draw a straight line. 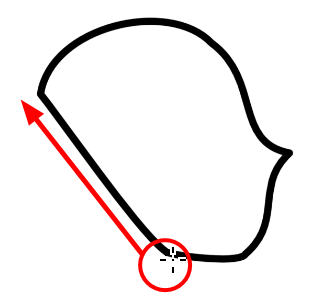 ‣ Hold [Ctrl] (Windows) or [z] (Mac OS XMac OS X) to force a line to join the end and start and end of the stroke your shape while drawing. ‣ Click the Add Brush button. The new pencil style appears in the list of presets. Renaming a pencil can make it easier to identify and access the pencils you use most frequently. You can delete the pencils you no longer use. 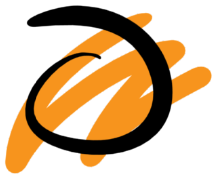 The properties available are different depending on whether you are drawing on a vector or bitmap layer. Also, you can optimize the smoothness of the contour of lines. You can modify the central line smoothness of your line using this option. This parameter smoothes the initial movement of your line. Increasing the value will result in a smoother line with fewer less control points. There are several line shape to choose from. You can select how the start, end, and joints in the pencil line are drawn. 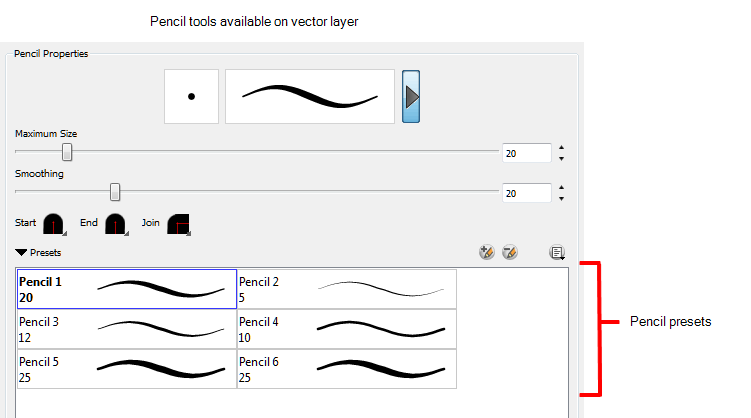 In the Pencil Properties window, click a line shape in the Shape section and select a shape from the menu. • Start: Make the beginning of the line round or flat. • End: Make the end of the line round or flat. • Join: Make joints round, mitred, or bevelled. Select View > Extras > Show Strokes or press [K] to see your strokes. You can modify the stroke shape with the Contour Editor tool—see Reshaping a Drawing Using the Contour Editor Tool. At times, you may want to change pencil lines to brush strokes. This converts a centre line stroke to a contour line stroke. 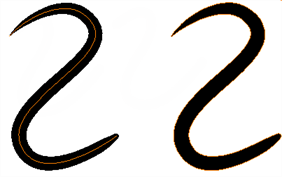 Or you can convert strokes to pencil lines. 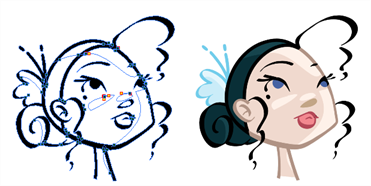 Right-click and Convert > Pencil Lines to Brush Strokes. To learn how to create a pencil line with more or fewer control points, see Reshaping a Drawing Using the Contour Editor Tool. To add control points, press [Ctrl] and click to create control points.